I saw the gif, but by the time I came back to show my wife, it no longer works. Excellent ep, but I have to admit given the title, I hoped it was a return of Pearl's mystery girlfriend. Then again, in a way, I guess it was. maybe, re: Trial, but honestly i wouldn't be surprised if it was just *she doesn't handle her feelings well*. Yellow diamond seems like the kind to really steam roll or push her agenda onto others. I wouldn't be surprised if she pushed Pink diamond to the point of thinking war was inevitable, or if she just knew about the ploy and found that it would strengthen her own position to get rid of pink diamond. Perhaps even bring her closer to Blue Diamond is some sort of unrequited love? Maybe, but honestly it's not like we don't have countless examples of what happens when people in positions of cultural power & privilege systems get invested in those. Especially ones that tend to express anger more easily or readily than other emotions. She's a Diamond. This is Order. It is Right for We to Rule. Crush the dissent, kill the dissent, erase the dissent, and return to Order. Nice! I wonder when it'll leak. So in case anyone didn't know there's been a handful of episodes dropping most of the week. they're uh, they're pretty good. 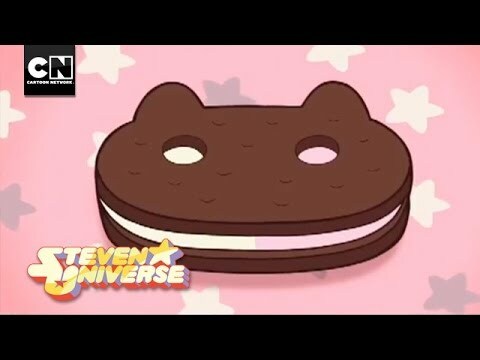 Classic Crewniverse, leaving us champing at the bit for more. I'm actually *very* tired of this model. I'm tired of 6-10 12 minute episodes *a year*. I'm tired of 'bombs', I'm tired of 'events'. Luckily for these assholes, the actual show-makers are good at what they do and got me interested a long time ago. But I might never follow another show like this again. that said, at least it's easy for me to catch up, when they finally come out. I don't bother paying much attention, though. if it wasn't for internet people I wouldn't notice when episodes come out. I have no more patience in my life for 'get hype'. that is, until I hear "We, are the Crystal Gems..." Then I'm back again. But I'm sad, because I fear hitting a day, before this show wraps up, when I won't be any more. Jerked around by release scheduling too many times to care any more. And I don't want that to happen to good work that comes after, from other show-makers and other creators. So I don't want this way of doing things to catch on. So this appeared on Prime Video and I'm watching the first season when I notice that Steven's dad has tan lines corresponding to Steven's outfit. What's up with that? Mystery tan lines remain a mystery. Whoa, that season finale was amazing. But where do we go from there? Damn, that was really something. Honestly, it was a bit unsatisfying. It felt like a five-course meal all heaped up on a single plate. Blue and Yellow turn against Steven, and then they like him again, time to rebel against White! Now let's introduce three new fusions in the space of three minutes! Now everyone's grayscaled, Steven gets deus-ex-gemina'd, he works his magic on White and then everyone's fine again. Oh, and White Diamond's cracked Pearl was actually Pink's pearl, I guess? Okay, everyone go to Earth! Also Lars is back. Happy ending, roll credits. Also, Steven, you literally just used your shield to deflect Yellow's attack on Blue, how did it not occur to you to try the same against White? Or shield bubble out of Garnet's grasp? C'mon dude. Speaking of which, did you catch the callback to the pilot episode? I feel pretty good about it ending right there. Maybe an epilogue episode or special, but I feel like we're finished, it's done, that's it, more or less everything worth thinking about is in as good an ending spot as it can be. yeah, probably a goodbye episode, more i think of it. but like i said, i'm tired of waiting on this show, as much as I love it. that hasn't changed. And it's run for more years than we deserve, perhaps. Also this isn't the end, only the end of this phase of the show. They've said that a whole new season is gonna start but they are very tight lipped on everything else.